Almost at the same with the official recognition of Scouting in Greece, there was the recognition of the first Greek Scout Troop at Alexandreia, Egypt after the initiative of Antonios Kokkinos, a gymnastics professor. Around the middle of 1912, the Troop got organized at the Athletic Club of Alexandreia's Sports Fans. Next year, the unforgettable Chief-Scout of Greece, Antonios Benakis, after getting assigned by SEP's Executive Board, proceeded to the official establishment of Hellenic Scouting in Egypt. He initially become President of this movement's Central Committee and then served as General Chief until the year 1927 that he settled in Athens. The Scout movement expanded rapidly among the greek communities of Egypt and Soudan. It's organization and activities were extremely successful. 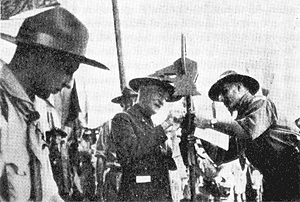 In 1913 the first Greek Scout Troops were established in Cyprus. During the inter-allied occupation of Turkey after the end of World War I, and the advances of the Greek Arny in Asia Minor, one by one, Greek Scout Troops are being established in the towns that get occupied. In Konstantinople, chief doctor Antupas with the help of Armostos Katexakis, establishes the first Greek Scout Troops at the greek athletics clubs of "Hercules" (at Tataoula) and "Hermes" (at Pera). In six months, 25 Greek Scout Troops are formed in Konstantinople and its suburbs. After a while (1921) Greek Scout Troops are established in Paris under Isaias Isaias -an Athenian Scoutleader- and the sponsorship of the Greek Orthodox Church of Agios Stefanos. In 1922 a Greek Scout Troop is formed in London but its operation was soon (1923) discontinued due to departure of its leader, E. Rallis. Greek Scouts in France multiplied and more Troops were estabished in other cities.